With full-size suction power, and a 40% bigger bin compared to V8™ Absolute for bigger cleans. The Dyson Cyclone V10™ vacuum has the most powerful suction of any cordless stick vacuum in use. The smallest, lightest, yet strongest vacuum cleaner motor Dyson has ever produced. Its ceramic shaft is cured at 1,600°C to make it three times harder than steel, yet with half the density. With the impeller moved from the front of the motor to the back, axial flow draws in cooler air to reduce the temperature and allow the motor to spin at up to 125,000 rpm. Which generates the suction power of a full-size vacuum. Generating forces of more than 79,000g, the vacuum filings microscopic particles – such as pollen and even bacteria – into the bin. By arranging each of the 14 cyclones concentrically around the central axis of the machine, air flows more efficiently through it. As the cyclones narrow, air is accelerated from 45mph to 120mph to create the centrifugal forces that capture fine particles. Longer-lasting battery for deep cleaning right through the home. 7-cell, energy-dense battery. The Dyson Cyclone V10™ vacuum’s lithium-ion battery has one more cell than the Dyson V8™ Vacuum, to run at a higher voltage and create more power. But because each of the seven high-capacity, nickel-cobalt-aluminium cathodes is slightly smaller, there’s no additional weight. Innate LED system diagnostics and altitude sensors enable the machine to automatically optimise power to the cleaner head at times. So suction power doesn’t fade. The ‘point and shoot’ alignment of the motor, bin and cyclone allows air to be drawn directly from the cleaner head into the cyclones in a straight line. this, combines with the more powerful Dyson digital motor V10™, increases suction to 20% more than the Dyson V8™ Vacuum cleaner. Whole-system filtration. Patented cyclone technology captures particles as small as 0.3 microns. With an airtight gasket around the cyclone assembly and a pressurised rubber seal around the advanced filter, the whole system is fully sealed – preventing dust, allergens and bacteria from leaking back into the air. This means the vacuum retains 99.97% of dust as small as 0.3 microns, and expels air cleaner than the air you breathe. Pre-and post-motor filters are combined into one unit for easier maintenance. Full-size suction power. Cord-free versatility. Deep cleans, anywhere. 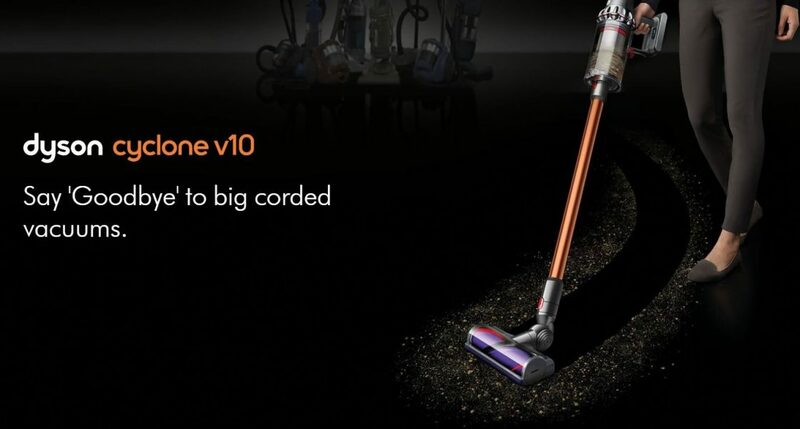 The Dyson Cyclone V10™ vacuum cleaner has the more powerful suction of any cordless vacuum. With a seven-cell, nickel-aluminium battery, you have the fade-free power to clean here, there and everywhere around your home. Corded vacuum cleaners can be bulky and heavy. So they take up lots of storage space. They can be hard to manoeuvre and difficult to lift. And power cords get in the way and tether you to the plug. The Dyson Cyclone V10™ vacuum frees your cleaning. Full-size suction power, with none of the hassle. 40% bigger bin. For bigger cleans. You can simply drop your Dyson Cyclone V10™ vacuum into the wall-mounted recharging dock. And it’s just as easy to grab and go. It also stores your tools, so they’re always to hand. ← Say hello to the new Yamaha MusicCast Family!